To meet rising student demand for easy rides to and from campus, the UO Campus Shuttle has added two new fixed routes. The off-campus route reaches areas south and west of campus. The Autzen housing route runs between the Erb Memorial Union and the apartments near Autzen Stadium. The original university route primarily runs on campus and nearby areas. All three routes run through campus and stop on 13th Avenue and University Street outside the EMU. Hours of operation are seven days a week from 5 p.m. to 1 a.m. The shuttle is free to all UO students and employees. An interactive online map of the routes shows shuttle locations in real time during the hours of operation. The shuttles can be identified by the green logos on the side, “taxi toppers” on the roofs and route names on the side of each shuttle. Lights also hang on the inside of the shuttles to create a more inviting environment. Shuttle stops are marked by signs with the green shuttle logo. 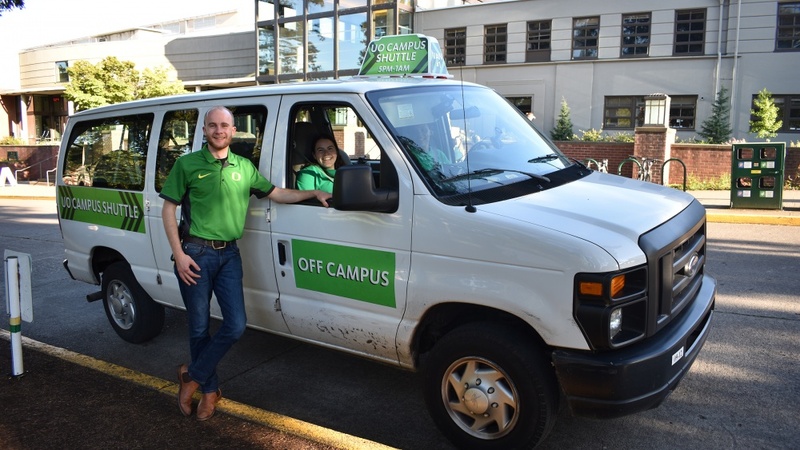 UO Campus Shuttle officially launched in January 2018 at the start of winter term. Since then, the shuttle has served more than 7,000 riders and averages 520 riders each week. The fixed-route shuttle is the third transportation service offered for UO for students, staff and faculty, along with the long-standing scheduled service Safe Ride and on-demand Designated Driver Shuttle. The UO Police Department, which oversees the UO Campus Shuttle, is looking to hire more paid shuttle drivers and add more volunteer navigators. Shifts for drivers and navigators are 4:30 to 9 p.m. and 9 p.m. to 1:30 a.m.
All drivers and navigators are required to do at least one shadow shift prior to working a full shift. Students interested in either position can observe a shift and learn about the work before formally applying; email uocampusshuttle@gmail.com and follow the UO Campus Shuttle on Facebook and Instagram (@uocampusshuttle).